On the one-year anniversary of Hurricane Sandy Oct. 29, members of the Obama administration’s special interagency task force were eager to placate the homeowners and business people growing impatient with the pace of arriving grants and contracts for rebuilding. On Monday, the Housing and Urban Development Department -- which has taken over coordination on Sandy relief since the Hurricane Sandy Rebuilding Task Force expired Sept. 30 -- announced a combined $5 billion in new aid through a second round of recovery funds to five states and New York City. The HUD Community Development Block Grant funds will help with housing, economic development and infrastructure. When the newly announced recipients have completed paperwork and the funds begin to flow, the allocations will be published in the Federal Register and eventually incorporated as trackable data on HUD’s portal for Hurricane Sandy. The format’s level of detail, however, while welcomed, is seen by some transparency advocates as below the high standards set by the Recovery Board in 2009, when it began publishing data on Recovery.gov to track the government’s massive $840 billion in anti-recession stimulus funds. The version for Sandy, HUD explains, is not at that level of “granularity,” but will continue to prove useful. Since the task force was set up last February, the government has provided direct assistance in some 70 programs to more than 230,000 people and small businesses in grants and loans administered by such agencies as the Federal Emergency Management Agency, the Small Business Administration and the Labor Department. As of last month, $13.5 billion of more than $39.7 billion had been paid out. The public-disclosure component of the undertaking involving 19 agencies, as noted in the task force’s August report, “Hurricane Sandy Rebuilding Strategy,” was coordinated at the task force’s Program Management Office. 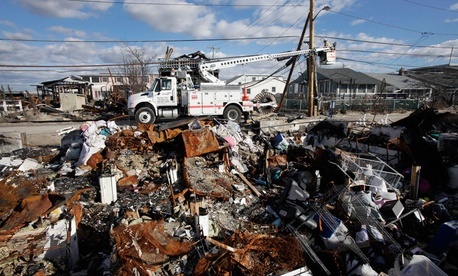 “The size, complexity and urgency of the funding for Hurricane Sandy recovery made it clear -- even before the Sandy Supplemental was enacted -- that the task force needed a central coordinating office that would work closely with agencies, the Office of Management and Budget and the oversight community, such as the agency inspectors general and the Recovery Accountability and Transparency Board,” the report said. The Program Management Office “was also established to leverage lessons learned from Hurricane Katrina as well as best practices from” the 2009 Recovery Act. One key lesson was that there “is a tremendous amount of public interest in understanding where the funds are going and what they are buying,” it added. So the Program Management Office developed the website, similar to Data.gov, in which “non-sensitive data and information could be shared with the public” in both narrative and graphic updates. The office also began to develop detailed information, such as funds and performance by state, in machine-readable formats that the public can download and analyze. The website as it stands today includes handy bar and line graphs of overall Sandy spending, as well as agency-by-agency amounts and spending by program. In addition, parts of the Sandy aid picture can be found on Data.gov, such as a recent entry Sandy Damage Estimates by Block Group. The Sandy contracts, not the grants, are available on the Federal Procurement Data System, which recently added a new “national interest action value” for Hurricane Sandy 2013 that is good through Dec. 17, 2013. But the HUD Portal’s data is not yet readily searchable on the broader spending reporting site USAspending.gov. And its numbers are several weeks behind those of Recovery.gov. The HUD-run site’s most recent batch, released Sept. 18, covers spending up until Aug. 31. By contrast, the Recovery Board offers data released Oct. 30 that covers spending up to Sept. 30. Nor does the HUD site yet allow users to pinpoint specific grant or contract recipients, their exact awards, or their precise locations. It does include a link to another site, FederalTransparency.gov, created by the Recovery Board in 2011. That sight originally was meant to track education jobs spending, but now has been adapted for Sandy; it allows searches by location and recipient and is based on contracts reported to FPDS. HUD officials, who asked to remain anonymous, told Government Executive that the law creating Sandy aid contained none of the detailed reporting requirements found in the 2009 Recovery Act. They pointed out that the contract funds headed to New York and New Jersey and points nearby are just beginning to flow, so that much of the localized data is not yet available. “There’s the same degree of rigor for reporting, and the recipients still have to report to their agencies,” one said. The officials also expect that the October government shutdown delayed some reviews of data quality. The Recovery Board executive staff, including Chief Technology Officer Shawn Kingsberry; Chief Information Security Officer Veda Woods; and Chief Technology Officer Hermanth Setty, will discuss the challenges they faced in tracking Sandy relief funding at Nextgov Prime on Nov. 20. Registration is free for federal employees.